Window film provides a handful of both decorative and functional uses around the home. Knowing the options can help you decide which type will work best for you and following detailed instructions for installation ensures they will look great from day one. Adhesive - As a thin 2 mm polyester film that bonds strongly to glass, it is good for a permanent, protective solution and is often less expensive than cling film. It is less forgiving and trickier to work with when installing, more difficult to remove and can't be reused. Non-adhesive cling - A slightly thicker 8 mm vinyl film, it's easy to work with both during installation and removal. Cling films can be reused but they are less transparent than adhesive films and the static properties attract more dust to the film. Decorative film gives ordinary glass an upscale look of stained glass, etched glass, frosted or textured glass. It can provide privacy and helps block UV rays but is typically less effective at reducing heat. 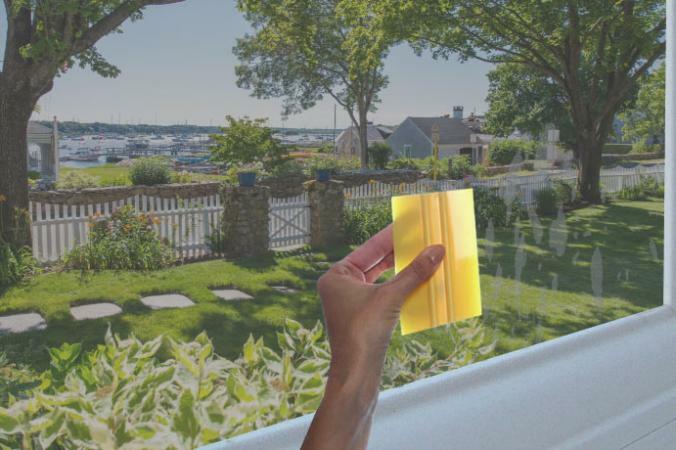 Solar film reduces glare and may block up to 99 percent of UV rays and nearly 80 percent of solar heat, helping to reduce cooling costs significantly. Privacy film may feature a frosted, reflective or colored surface in varying degrees of darkness. 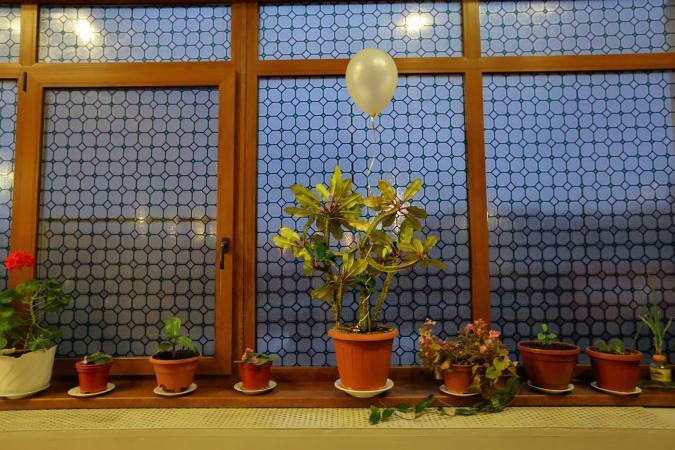 It prevents viewing from the outside in but may also reduce incoming natural light and outside views. Reflective films become see-through at night. Security film makes glass more shatter resistant and harder to break while holding glass fragments together if the window is broken. It also provides excellent insulation from outside temperatures. If you rent a home or redecorate often, use static cling window film which removes easily without leaving residue behind. Use solar film on windows with great outside views but expose furniture upholstery, expensive rugs or artwork to daily direct sunlight. Decorative privacy film is a good choice for front doors with inset glass windows and sidelights. If you own a home where high winds from thunderstorms, hurricanes or tornadoes are common, security window film is a smart choice. Once you've decided what type of window film to install and where, it's time to measure your windows. The measurement should only include the inside surface of the glass and not any part of the frame. Measure the width of the window inside the frame. Measure the height of the window inside the frame. Add 2 inches to both the width and height measurements. Most window film is sold by the foot. A window measuring 21 inches by 42 inches would require a window film at least 2 feet in width and 4 feet long. When doing a rough cut to size for the window, be sure to include the extra 2 inches on the width and height, so all four sides end up with 1 inch of overlap. Once the film is in place, it can then be trimmed for an exact fit inside the window frame. Measure the width of the window at the base. Measure the height at the tallest point of the curve, in the exact center of the base measurement. Measure the height at the center. Measure the width at the center. Measure just the width in the center and add 2 inches. Use the same number for the height. Refer to this measuring guide for other odd window shapes or contact the window film supplier for help. In order to make a rough cut to size for the window on the window film, you will first need to make a template of the window's shape by taping a large piece of butcher paper over the window. Trace the outline of the window's opening and use this as a guide to cut the window film, adding a 1 inch border around the entire shape. If you want to avoid the difficulty of trimming window film on a curve, look for a window film supplier that offers a "Trim to Size Service," such as Wallpaper for Windows. The film will arrive already sized for a perfect fit within the frame, eliminating the need to cut or trim the film at all. This service does cost extra and leaves absolutely no room for mistakes. The following installation instructions apply to both adhesive and non-adhesive window film, as they install mostly the same way. However, you need to use more caution when separating the release liner from adhesive film, to ensure it doesn't stick to itself or anything else before you place it on the glass. Add half a teaspoon of baby shampoo to the spray bottle. Fill the rest of the way with distilled water. Spray a generous amount of cleaning solution onto the glass and wipe down with a lint free cloth. Use the razor blade to scrape off any stuck on debris, testing it first in an inconspicuous area to make sure it doesn't scratch the glass. Spray the solution on again and wipe away any remaining residue. Use paper towels to remove any excess moisture at the edges and corners. Measure and cut the window film so it is 1 inch larger than the window's surface on each side. Use a straight edge to ensure your cuts are straight, especially if the film has a decorative pattern. Tip: Window film can dull the blade of a utility knife and a dull blade can tear the film. Change to a new blade each time 10 feet of window film is cut. 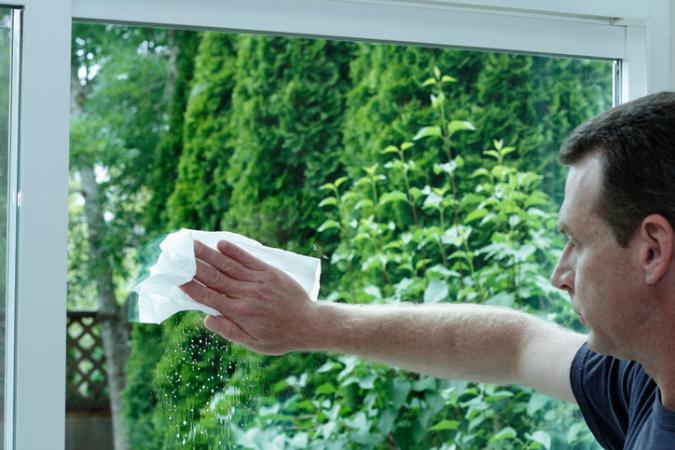 Spray a generous amount of the cleaning solution over the entire surface of the window. Make sure there are no dry spots and if the solution starts to dry before applying the film, spray more solution on first. Removing the liner from the back or adhesive side (the side that will face the window) can be tricky, so commission the help of a friend to hold the film for you if possible or lay it out on a flat surface. Be careful not to crease the liner. Wet your fingertips with the solution to avoid leaving any fingerprints on the film. Use your fingernail at one of the corners to begin separating the liner from the film. As you pull the liner away from the film at a diagonal angle, spray a generous amount of the cleaning solution on the exposed adhesive side. Do not allow the film to roll back up on itself. Note: If using non-adhesive window film, it's not necessary to spray the side that will face the window, as long as the surface of the window is thoroughly wet. Tip: If you have trouble separating the liner from the film, try this technique. Attach two 4 inch long pieces of transparent tape to the front and back corner of the film. Apply about an inch of the tape to the surface of the film and allow the rest to hang off the pointed end of the corner. Press the two pieces of tape together then quickly pull them apart to begin separating the clear liner from the adhesive side of the film. Ensure that both the adhesive side of the window film and the window's surface are thoroughly wet with cleaning solution, as this allows you to move the film around and position it in place before it begins to stick to the window. Holding the film at the corners, press the wet side of the film to the window, starting at the top and smoothing it out as you go down. Position the film so there is an equal amount of overlap on all four sides. Starting in the center, use the plastic squeegee and a firm pressure to slide air bubbles and excess solution to the edges of the window film. Repeat the process in all directions, removing as much air and moisture as you can. If the squeegee starts to drag, spray on more solution. Wipe away moisture along the edges with paper towels. 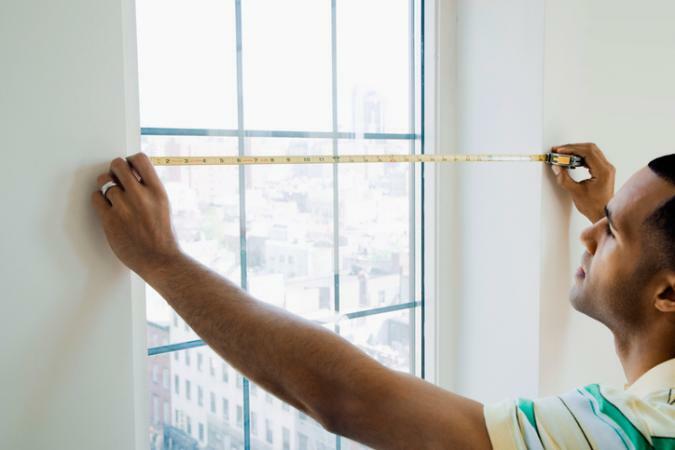 Using a ruler and a utility knife, trim the excess window film around each side of the window. Leave a 1/16-inch border of exposed glass on each side to allow for thermal expansion of the glass and to squeegee out any remaining moisture. Once you have trimmed all the sides, spray the film down again with cleaning solution and squeegee out the remaining solution using very firm pressure. Wipe away excess wetting solution along the edges with paper towels. Tip: It may take several days for the window film to dry completely and for the adhesive to cure. It may appear milky or foggy for up to a week. Do not attempt to move or clean the window film during this time. It is recommended to wait 30 days before cleaning adhesive window film to ensure the adhesive has cured completely. Use an ammonia-free household cleaner to clean windows treated with any type of window film and avoid abrasive cleaners or rough, abrasive surfaces (even coarse paper towels) that can scratch the surface of window film. Non-adhesive static cling window film is very simple to remove. Starting in a corner, use your fingernail to get under the film and then slowly peel it away from the window. It must be stored on the original backing paper or liner that came with it if you plan to reuse it. Use a stainless steel razor to remove adhesive window film. A professional glass scraping tool with a 6 inch stainless steel blade works well for removing the film and leftover adhesive residue. Stainless steel blades are less likely to scratch the glass. To remove leftover adhesive, spray the glass with soapy water and carefully scrape it away with the scraping tool. For tough residues, you can also use a spray adhesive remover. Whether it's a decorative accent, a functional protectant or both, window film is a relatively inexpensive way to upgrade the architectural features of your home without needing to hire professional help. Select the right one and install it perfectly yourself.